Psychologists and therapists who want to work more effectively with athletes and teach mental skills to enhance performance. Coaches who want to uncover mental game obstacles, develop strategies to overcome them and to instill confidence, focus, and composure in the athletes they coach. Athletic trainers who want to utilize mental coaching with their athletes to help their athletes triumph over mental obstacles that often result from sports-related injuries or other health-related challenge. Mental game coaches or sport psychologists in training who want to supplement their studies with proven mental game strategies and an effective mental training system. Life coaches who want to help athletes improve their mental game with a proven system. As a Certified Mental Game Coaching Professional (MGCP), you’ll learn to master the methods you need to help athletes build confidence, improve focus, galvanize team cohesion, enhance communication skills, boost productivity, and maximize performance. To become a Certified Mental Game Coaching Professional (MGCP) takes approximately 10 weeks (12 weeks for a summer program), meeting once a week for two hours by web video conferencing. In addition to the weekly learning sessions, there will be approximately 30-40 hours of homework assignments during the course, which will include athlete mental game assessments, and application of mental game skills based upon actual situations where athlete performance is stunted by mental obstacles. Throughout this 10-week program, you will assist athletes, receive 18 case studies, get hands-on experience in dealing with real-life challenges (work with a local athlete), and receive written materials to ensure that you have the tools necessary to be a powerfully effective mental game coach. By the end of the program (provided you have completed all requirements for graduation, including passing the certification exam), you will receive a certification from Peak Performance Sports, LLC as a certified Mental Game Coaching Professional (MGCP) and will be able to use the MGCP title and insignia and earn a listing on MentalGameCoachingPro.com as a certified MGCP. 5 years or more of experience as a competitive athlete, a coach, or trainer in your sport of expertise; or a MS in psychology or counseling psychology, or an NLP certification. Understanding of the psychological demands of your sport. Ability to apply what you learn to real-life sport scenarios. Access to a team or individual athletes you can mentally train. 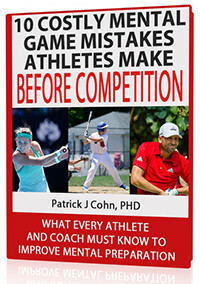 A desire to learn about mental game coaching and sports psychology. Use of Dr. Cohn’s Athlete’s Mental Aptitude Profile (AMAP) to help you identify an athlete’s or team’s mental game strengths and weaknesses. Use of other sports-specific assessments, such as the Golfer’s Mental Aptitude Profile (GMAP), to identify mental game challenges with your golfers. Examples of pre-seminar questionnaires to use before you give a seminar. The MGCP 20-chapter workbook, which includes exercises to teach you how to identify mental game challenges and obstacles that influence performance; develop mental skills in individual and team members; and improve teamwork and communication. Over 150 mental game coaching handouts you can use with your students to help you give effective team seminars. 18 real-life case studies focusing on a different challenge in sports psychology and Dr. Cohn’s solution to each challenge. Actual recorded case studies of Dr. Cohn’s athletes which you listen to via audio or watch on video. A list of books, audios, and other resources you can purchase to enhance your mental game coaching knowledge. A life-time subscription to Peaksports.com membership site with all the benefits including continuing education for certified MGCPs. This gives you the ability to email Dr. Cohn with any questions you may have about the MGCP program (a $900 value)! Qualification into the Mastermind program for mental game coaches (you save $395 as an MGCP). Our unique mental coach programs are also included in the MGCP Course. They are available to purchase for non-MGCP participants. If you buy one or more of these programs outside of the MGCP course, you can apply the cost and upgrade to the self-paced or live certification course. 3. Mental Coach’s Playbook: Working With Sports Parents — Learn how to help sports parents support their athletes’ mental game using my proven methods and tools. This program was designed to help mental coaches improve their effectiveness with sports parents and their athletes. The Mental Coach’s Playbook program complements your existing mental training program—it does not change what you are currently doing. ($399) Learn More About Mental Coach’s Playbook…. What’s the difference between the Self-Paced and the Live Certification Program? In the Self-Paced Program, you receive all the materials that you get in the Live Certification Program but without the weekly classes, case study reviews, final exam and certification. View the difference between the Self-Paced Program and the Live MGCP Certification Program. You’ll be eligible to be listed on Peaksports.com as a Certified Mental Game Coaching Professional, for which you will be entitled to receive referrals in your area of the country. You’ll continue to receive ongoing tips from Dr. Cohn to improve your mental coaching success and build your career as a successful mental coach. You’ll enjoy unlimited FREE access to our “members only” area for mental game tools, resources, and more. You’ll have access to leads from athletes looking for a mental game coach. You’ll be able to access Dr. Cohn via email for answers to questions regarding mental coaching. The phases of mental coaching athletes. How to get work with athletes & coaches. How to use the AMAP and how to use mental game assessment. The top mental game skills for peak performance (confidence, focus, etc.). How to improve the quality of practice. How to help your athletes practice their mental skills. How to enhance team cohesion and communication. How to get feedback on your mental game coaching from athletes. How to sharpen your mental game knowledge via other readings and research. Ethical principles for mental game coaches. Recognizing when you need to refer your students to other more qualified professionals. Ability to identify mental game obstacles affecting an athlete’s performance. Authority to administer and interpret Dr. Cohn’s AMAP or Athlete’s Mental Aptitude assessment. Competence in identification of mental game strengths and weaknesses of athletes. Expertise in outlining mental game plans for individual athletes and teams. Know-how to deliver one-hour seminars to teams on achieving peak performance. Proficiency for effective communication by asking athletes right questions. Skill for integrating mental game skills into athletes’ regular practices. Follow up techniques with your athletes to ensure continuing adherence to mental training. Get started now and complete an application at the MGCP website. Visit the MGCP certification web site for more information! Call us today at 888-742-7225 for more information.